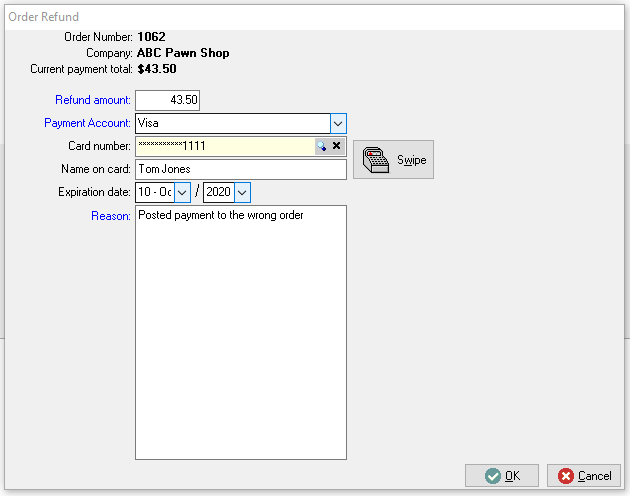 After a customer pays using the online payment method, the payment will appear in Control just like it would if it were locally entered. In certain cases, the employee may want to void the payment (perhaps the customer wants to pay with a different card or paid someone else's order by accident). If the customer were allowed to void the payment, Control would reverse the accounting effects of the payment (backing out the GL, putting the order back in A/Rs, etc.). However, Control does not have the credit card information necessary to actually reverse the funds. Instead, the employee should be directed to use the “Refund from Order” action to re-enter the credit card information and return the money. We have an order that has been fully paid by the customer through Control's online payment feature. Since the wrong credit card was used to pay the invoice, your customer would like a full refund on the card used at checkout. 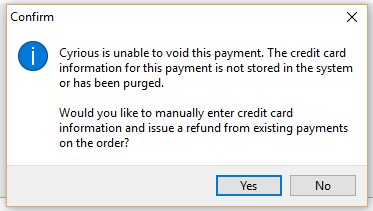 As you normally would, right-click on the payment and select Void. Click Yes on the refund confirmation pop-up. Notice that your online payment has now been refunded.